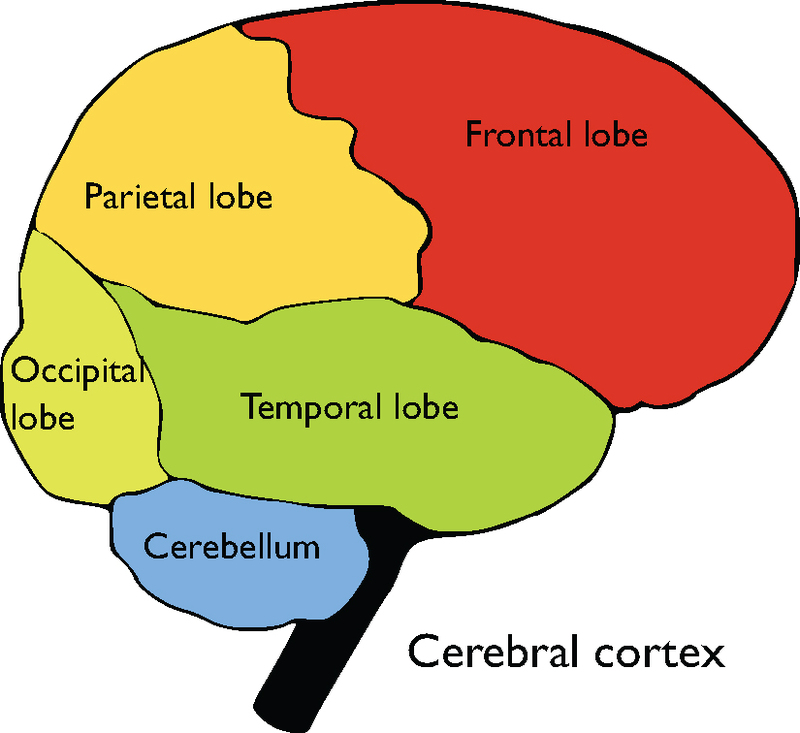 The cortex is divided into four main lobes: frontal, parietal, occipital, temporal. Each lobe contributes to overall functionality of the brain and each lobe has many different roles. The frontal lobe is involved in conscious thought. The parietal lobe is important for spatial reasoning. The occipital lobe is required for visual processing. The temporal lobe contributes to language and face recognition. frontal lobe: The frontal lobe is an area in the brain of mammals, located at the front of each cerebral hemisphere and positioned anterior to the parietal lobe and superior and anterior to the temporal lobes. In humans, it contributes to a number of higher cognitive functions including attention, planning, and motivation. temporal lobe: A region of the cerebral cortex that is located behind the temples and beneath the Sylvian fissure on both cerebral hemispheres of the human brain. This region is involved in auditory perception, speech and vision processing, and the formation of long-term memory as it houses the hippocampus. parietal lobe: A part of the brain positioned superior to the occipital lobe and posterior to the frontal lobe that integrates sensory information from different modalities, particularly spatial sense and navigation. occipital lobe: Located at the back of the head, this is the visual processing center of the mammalian brain containing most of the anatomical region of the visual cortex. Cerebral lobes: The four lobes (frontal, parietal, occipital, and temporal) of the human brain are depicted along with the cerebellum. The frontal lobe is an area in the mammalian brain located at the front of each cerebral hemisphere and positioned anterior to (in front of) the parietal lobe and superior and anterior to the temporal lobes. It is separated from the parietal lobe by a space between tissues called the central sulcus and from the temporal lobe by a deep fold called the lateral (Sylvian) sulcus. The precentral gyrus, forming the posterior border of the frontal lobe, contains the primary motor cortex, which controls voluntary movements of specific body parts. The frontal lobe contains most of the dopamine-sensitive neurons in the cerebral cortex. The dopamine system is associated with reward, attention, short-term memory tasks, planning, and motivation. Dopamine tends to limit and select sensory information that the thalamus sends to the forebrain. A report from the National Institute of Mental Health indicates that a gene variant that reduces dopamine activity in the prefrontal cortex is related to poorer performance in that region during memory tasks; this gene variant is also related to slightly increased risk for schizophrenia. The frontal lobe is considered to contribute to our most human qualities. Damage to the frontal lobe can result in changes in personality and difficulty planning. The frontal lobes are the most uniquely human of all the brain structures. The parietal lobe is a part of the brain positioned above (superior to) the occipital lobe and behind (posterior to) the frontal lobe. The parietal lobe integrates sensory information from different modalities, particularly spatial sense and navigation. For example, it comprises the somatosensory cortex and the dorsal stream of the visual system. This enables regions of the parietal cortex to map objects perceived visually into body coordinate positions. Several portions of the parietal lobe are also important in language processing. Also, this lobe integrates information from various senses and assists in the manipulation of objects. Portions of the parietal lobe are involved with visuospatial processing. The two occipital lobes are the smallest of the four paired lobes in the human cerebral cortex. Located in the rearmost portion of the skull, the occipital lobes are part of the forebrain. At the front edge of the occipital there are several lateral occipital gyri separated by lateral occipital sulci. The occipital lobe is involved in the sense of sight; lesions in this area can produce hallucinations. The temporal lobe is a region of the cerebral cortex located beneath the lateral fissure on both cerebral hemispheres of the mammalian brain. The temporal lobes are involved in many functions, such as retaining visual memories, processing sensory input, comprehending language, storing new memories, feeling and expressing emotion, and deriving meaning. The temporal lobe contains the hippocampus and plays a key role in the formation of explicit long-term memory, modulated by the amygdala. It is involved in the senses of smell and sound as well as in processing of complex stimuli. Adjacent areas in the superior, posterior, and lateral parts of the temporal lobes are involved in high-level auditory processing. The temporal lobe is involved in primary auditory perception such as hearing and holds the primary auditory cortex. The superior temporal gyrus includes an area where auditory signals from the ear first reach the cerebral cortex and are processed by the primary auditory cortex in the left temporal lobe.